We’ll be going head to head with Odd Cafe in Greenside this Saturday.. be sure to check back next week for the results. I’m a big fan of reading restaurant reviews, it’s somewhat of an addiction really, and recently I had been reading quite a lot about a little place called District Six Eatery. All the reviews were complimentary and there was much to be said about this little tidbit of Cape Town right here in our very own Joburg. So the restauranteerers and I set out on a rather chilly evening to see what all the hubbub was about. The team was ready, the venue approved. The match was ON! 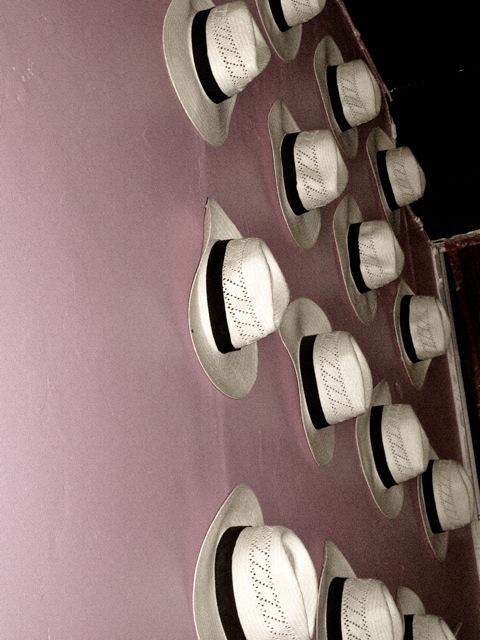 Décor: Pink walls, panama hats (or whatever they are called in Cape Town) and family pics make up the décor of D6. Pink table clothes are complimented by pink and purple chairs illuminated in the glow of an old fashioned gas lamp. Sounds garish, but it all seems to work inside this little Greenside gem. This place isn’t pretentious, not by a long shot. It almost feels like you’re sitting in your granny’s lounge – if your granny was from District 6 and collected jars of pickles. It’s warm, homely and comfortable – which is just what a chilly Joburg night called for. Vibe: D6 is tiny. About 5 tables inside and a few outside – with its growing popularity, it’s definitely not a place you can just rock up to and expect to get a table. So book! We arrived around 18.30 and the restaurant quickly filled up. We were by far the loudest table, but there is nothing unusual about that. D6 isn’t the kind of place you go to be seen (thank goodness ‘cos after a hard days work “being seen” isn’t high up on my list) It’s all about the food and the crowd you’re with. The vibe is relaxed and easy – kind of like your favorite poofy chair. Service: Waitress isn’t a term I would use to describe the lady who served us. For me, waitress is sort of a general term for anyone who takes an order and brings your food. With the occasional added bonus of a grunt of recognition. The staff of D6 aren’t about waitressing. They are about welcoming you into their “home”, telling you about the food they have prepared especially for you and serving it to you like you’re their next door neighbor or favorite friend. 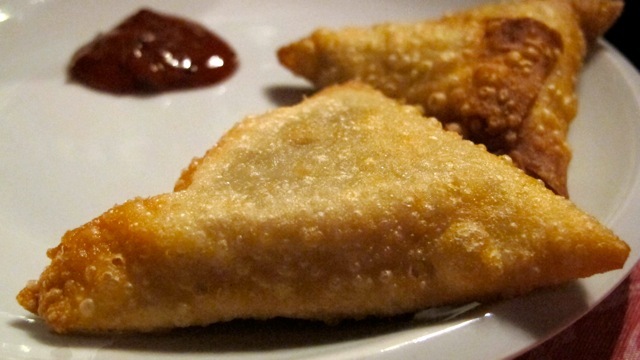 Starters: – Choice of samoosas with salad (mince, veg, potato), chicken livers or veggie soup. I chose the chicken livers and being a little scared of anything too spicy my first question was “How hot are they?” The response? “Not that hot”. I was lied to (or maybe, I’m just more of a chili wuss than I thought). The portion was huge, the flavor divine, but my friends, those livers were HOT! I managed a few mouthfuls, polished off the bread that came with it and passed the bowl over to Ingrid who must have a mouth of steel as she proclaimed they weren’t hot at all! I have it on good authority that the samoosas were awesome. They looked fantastic – crispy and not oily like the normal variety – but I was too busy dousing the flames in my mouth to try one. Babotie – my dish. A classic, can’t go wrong. No wait, you probably can, but this one didn’t. It was just what I expected it to be – a portion the size of my head and packed with flavor. 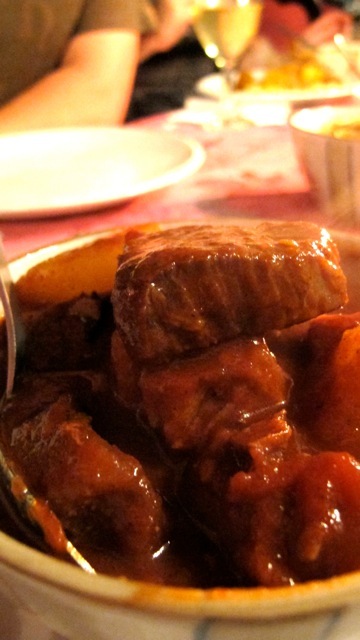 Lamb Curry – more a stew than a curry really. 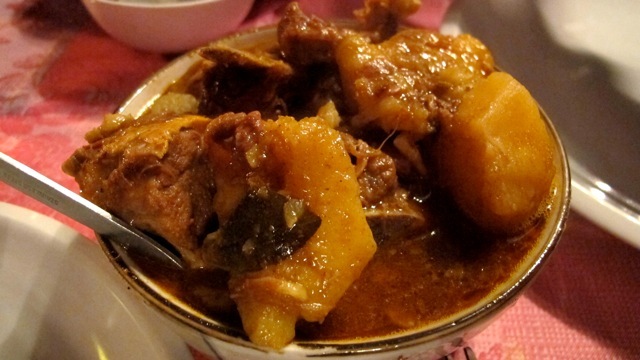 Meat falling off the bone and soft potatoes. Top marks! 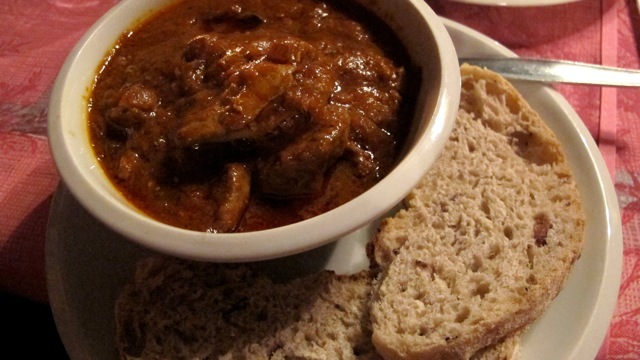 Tomato Bredie – Who knew there was lamb in it? Not me! The little taster I had was amazing (thanks Steve). Reminded me of a tomato sauce truck smashing into a cinnamon Dentyne (you know the chewing gum?) truck and a little lamb got caught in between the two. YUM! All mains were served with a big bowl of rice which was passed family style around the table. Dessert: – Choices for the evening were milk tart (or as I was told by my boyfriend repeatedly MELK TERT), koeksisters, pumpkin fritters and bread pudding. I shared the milk/melk tart/tert. I’m not a huge lover of milk and it was quite milky (funnily enough) but the pastry was divine and the piece we got could feed a family of five – “pastry” and “big” always makes me happy. Dom and Steve shared the koeksisters. Now, my recollection of koeksisters is a twisted piece of dough soaked in syrup. 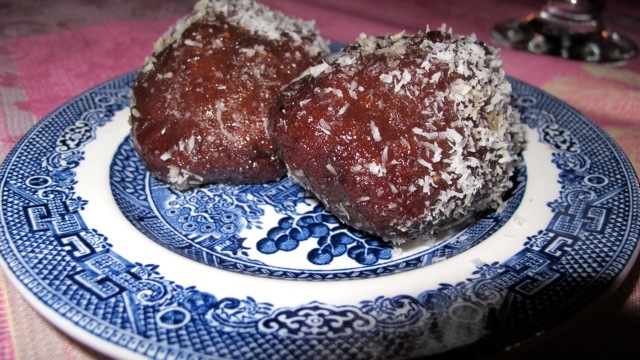 These were different and there was much debate at the table whether they were in fact koeksisters. Some said pumpkin fritters, some shouted (namely me) weird koeksisters and others argued lamingtons (huh?). Balls of whole-wheat dough, drenched in a syrupy substance and coated in coconut? You decide. All in all I would say another outright victory for Team Restauranteering. *cue cheesy theme song* So, if you have a hankering for some Cape home cooking with a touch of the quirky, head over to District Six Eatery, you won’t be disappointed. On a side note: District 6 does not have a liquor license but are happy to have you bring your own wine.